R.S. Hughes carries a large selection of product shapes and sizes to help best meet your specific applications. Width, length & height are some of the more common measurements to consider. This SKU has a 9 in width. The Miller body belt is made of leather, comes in yellow and meets CSA, OSHA standards. 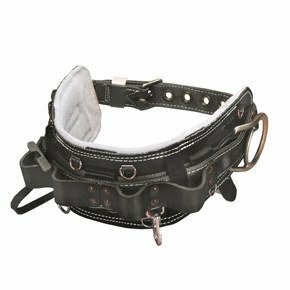 For proper security and safety this body belt offers a maximum working load of 400 lb. Supports waist size(s) of 44 to 54 in. This item comes with the following: D-Ring, D-Saddle.